Political stability is a guarantee for functioning trade among the established economic nations. National solo attempts such as the Brexit, the protectionist trade policy of the USA, the difficult political situation in Turkey or the Russia sanctions destabilize economic relations. In the recent case of a 'hard' Brexit, large companies have announced an investment freeze for Great Britain. In my comment for the German magazine Springer Professional I pointed out that the hard Brexit calls for a strategic reorientation (only available in German). Changes in world trade require companies to make far-sighted decisions on strategically important investment and location issues. In order to remain competitive, manufacturing companies with complex supply chains must accurately determine the scope of additional financial burdens in volatile conditions and analyze changes in product and total cost structures in detail. Enterprise Product Costing (EPC) supports companies in calculating these additional costs by recording and calculating product costs company-wide, uniformly and across all locations and departments. 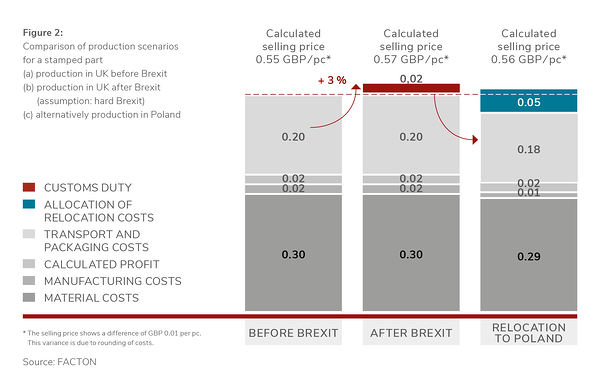 A detailed breakdown of the cost structures and the simple simulation of the different scenarios leads to a resilient analysis of all choices. Let me take a more concrete look at the problem with customs duties using the example of Brexit: In future British goods and services could be subject to customs duties that would make cars exported from or to the UK 10 per cent more expensive. The import and export of goods will entail higher personnel, administrative and financial costs. For economic nations such as the USA and Australia, however, new trade agreements with the EU could take precedence. The UK would face an incalculable loss. Companies on the island are therefore considering relocating to EU countries. It is important to calculate at an early stage and to calculate additional financial costs due to customs duties based on a rough preliminary calculation or estimate. The forecasting of future tariffs and additional financial costs is highly relevant in economically uncertain times. However, the results are one-dimensional and are too short-sighted when it comes to far-reaching decisions such as relocations and investment decisions. The example of a location discussion shows that the simple calculation of customs duties and pending costs is not enough. A comprehensive comparison is necessary that considers the cost and earnings situation of the production sites and additional financial burdens . To what extent do customs duties influence direct material costs for purchased parts or profit margins for finished goods? In our Webinar on Demand we will show you how to analyze and calculate additional product costs caused by customs duties precisely and realistically. With Enterprise Product Costing, companies ensure that calculations of participating and alternative locations are carried out using the same methods and are comparable. This is based on uniform and standardized data sets. Differences in cost structures, such as investments in machines with different depreciation periods, differing wage costs or changing logistics costs, are quickly determined by automatic comparison functions. Parameters of the production site are exchanged with just a few clicks and the options are calculated almost effortlessly. A realistic comparison of production conditions between two or more production sites becomes possible because minimal changes in costs, even of the smallest components of a product, are considered. The management level dispenses with assumptions and estimates and makes decisions based on clear and comprehensible key figures. 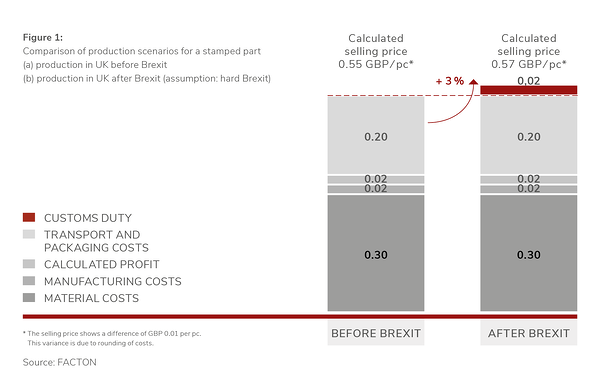 I'll sum it up: With a company-wide view of even the smallest part of the product, continuous calculations and a comparison of the possibilities, the effects of future customs duties such as those associated with the Brexit are analyzed holistically. Enterprise Product Costing helps companies to recognize the effects of changes early and quickly compared to other methods. This strengthens strategic and far-sighted decisions. Learn more about Enterprise Product Costing in our webinar "7 Ways to win the costing game".